Mordheim: City of the Damned developer Rogue Factor has announced a new Warhammer: 40K title, Necromunda: Underhive Wars. There have been plenty of Warhammer games announced and released over the past few years. They range from third-person action games (Warhammer 40K: Space Marine) to turn-based strategy/real-time tactics titles (Total War: Warhammer). One of those games was tactical RPG Mordheim: City of the Damned. Developed by Rogue Factor and published by Focus Home Interactive, Mordheim adapted the tabletop game of the same name to the world of video games. Now, Rogue Factor and Focus Home are teaming up again with a new Warhammer 40K tabletop adaptation: Necromunda: Underhive Wars. The original Necromunda tabletop game had players controlling rival gangs that were battling it out in the Underhive. The upcoming game is much the same, described in the press release as a turn-based tactical RPG. 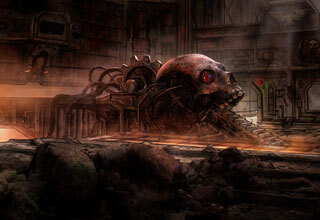 The Underhive is said to be "a gigantic warren of derelict factories, rusted metal husks, and forgotten technologies. Anarchy, violence, betrayal and death rule this hellish place, long forsaken by any semblance of civilization." There's no word on timing, or any further information available on the game just yet, but we'll likely hear more when Focus Home holds its "What's Next de Focus" event in Paris, France on February 1.